Symmetrical Twelve-Tone Patterns is my most recent release (2/1/2013). Symmetrical Twelve Tone Patterns is a 284 page book with a large reference component and about 100 pages of extensive notated examples and instruction. Guitar Pro files of all the examples in the book (in GP6 and GP5 format). For those of you unfamiliar with this musical notation, tablature platform and playback program, having Guitar Pro files means that the reader can hear the examples without having a guitar handy and can work as a phrase trainer to help the reader get the examples to up to speed. MIDI files of the musical examples. PDFs of the musical examples. MP3s of all the musical examples (again, exported from the same material). Symmetrical Twelve-Tone Patterns presents 12-tone patterns in both improvisational and compositional contexts. It shows how to create various intervallic lines and creates the outline of a tune and dissects how all the parts were created using this method. If you’re looking for ways to explore new avenues in playing or in your writing this is the book for you! I like physical books and the softbound version looks really good on my music stand – but I understand that some people like pdfs. 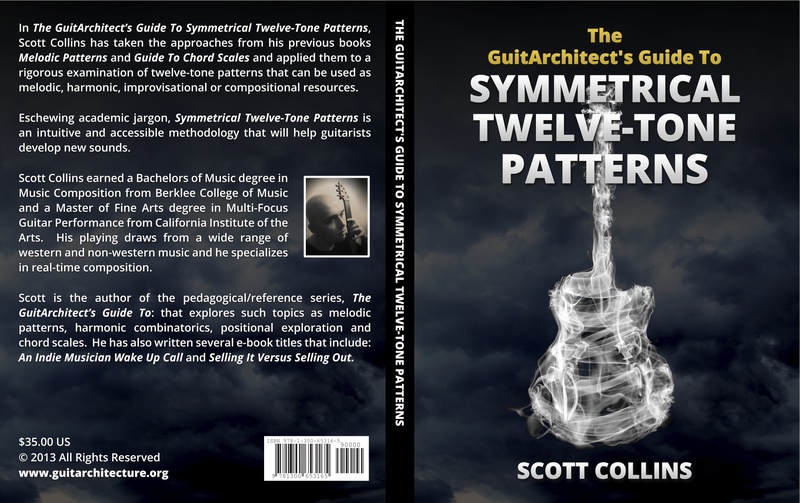 The softbound copy GuitArchitect’s Guide To Symmetrical Twelve-Tone Patterns is for $31.50 and the e-book pdf is $15. Both are available from The GuitArchitecture Product page on Lulu.